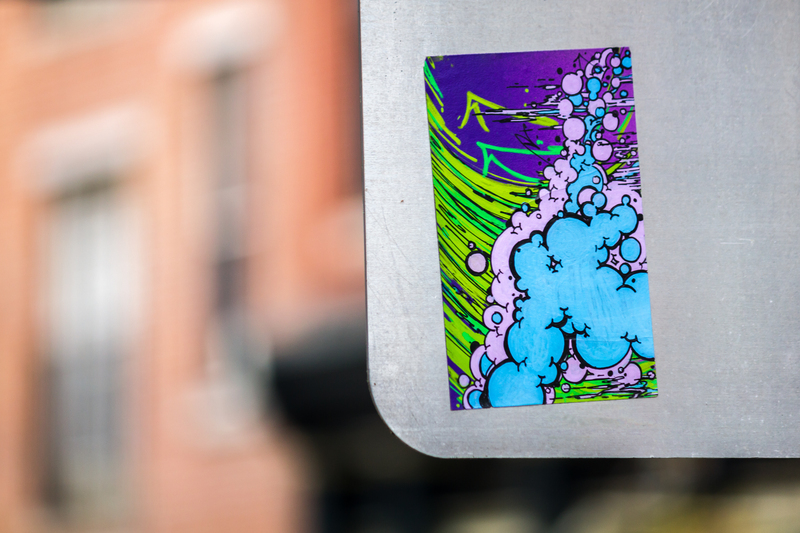 Philly has one of the best, most active stickers scenes in the U.S. Hands down, period. I know it, you know it, and if you walk around Philadelphia for even just five minutes you can see it. 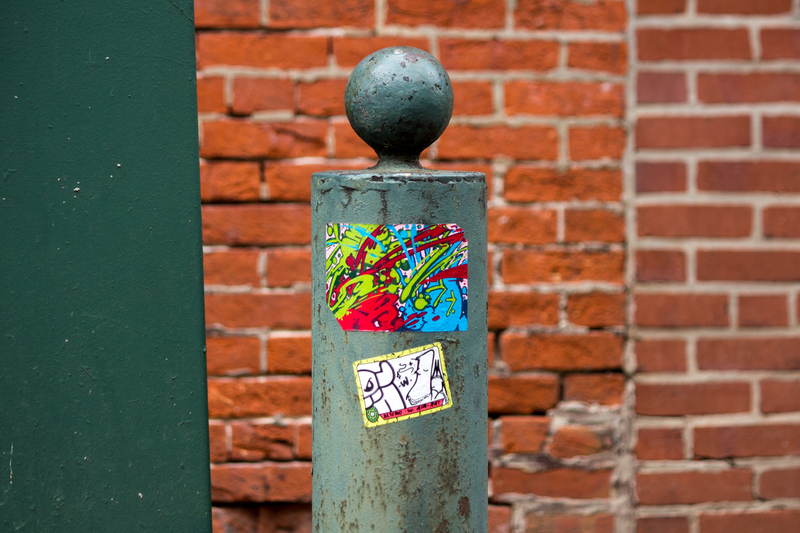 Stickers are a vital part of street art here. But, they don’t often get too much attention outside of the small community of artists and writers who create them. And considering the amount of talent there is there, that’s a shame, if you ask me. Well, Streets Dept readers, this is exactly why I wanted to start this new Interviews with Street Artists series: to build a better understanding of Philadelphia’s street art world and who’s building it! 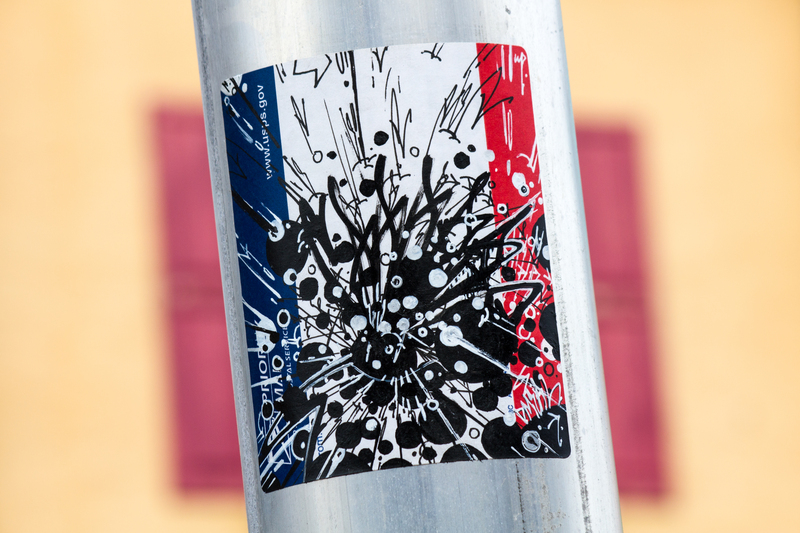 So today, new Streets Dept Contributor, Eric Dale, will be chatting with Darkmeal, a Philly-based artist who creates dense and explosive abstract stickers with a distinctly Philly texture. 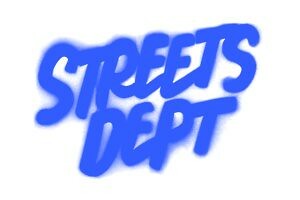 Streets Dept’s Eric Dale: Hi! Thanks for chatting with me. So first of all, how would you describe your art to someone who’s never seen it? 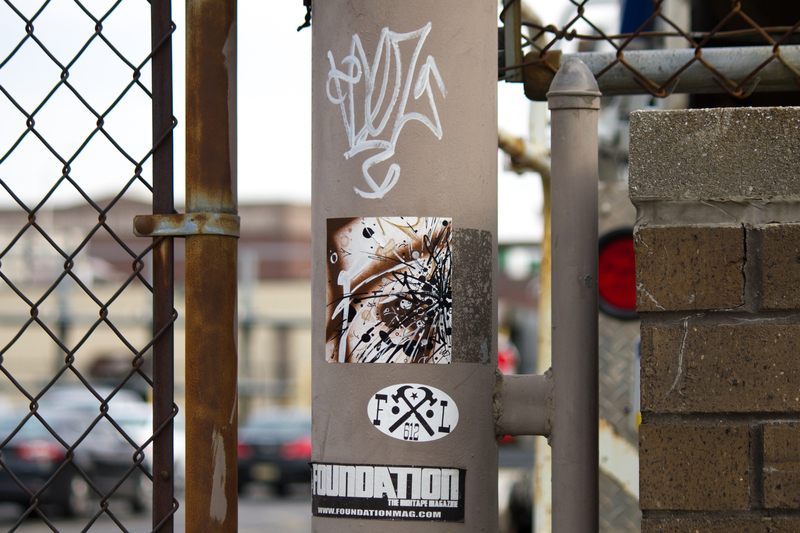 Darkmeal: Probably as abstract graffiti – I incorporate Philly handstyles into what I do. 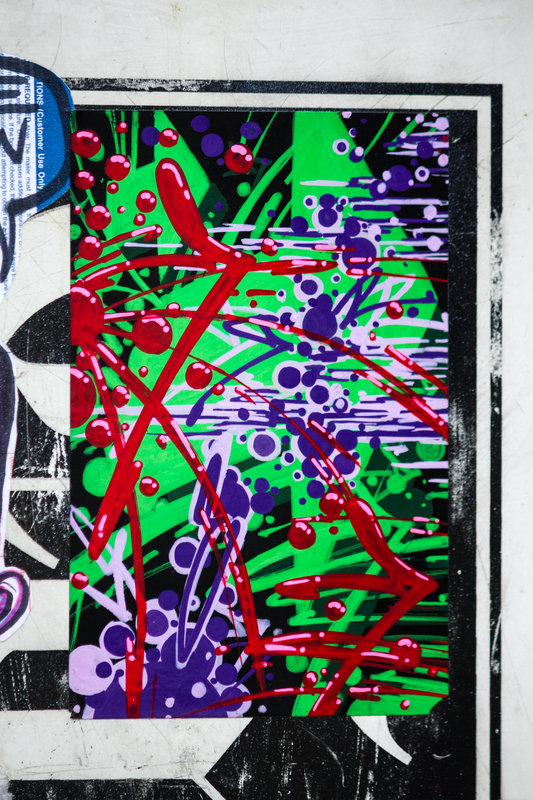 Primarily it’s sticker art, but I’ve got some stuff on canvas and other materials that doesn’t go out into the public. 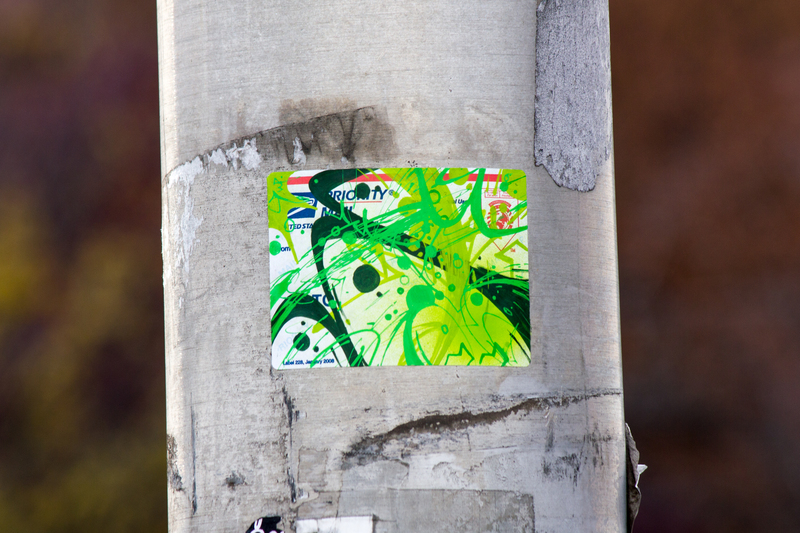 SD: As someone who is continuously exploring street art in Philly, I have to say your work has a pretty distinct look. How did you develop your style? DM: I’ve been painting and drawing in a similar style for more than 10 years, but I never really felt like it was something that was completely fleshed out. I always photographed graffiti, but it wasn’t until I started to study Philly handstyle in earnest and got a little comfortable with it that I started incorporating that into the rough style I use now. I was working with regular letterforms and text previously, but once I brought in the handstyle things kind of clicked into place. From there, I thought, well if I’m going to reference this Philadelphia folk art and history, I should probably put it out in the streets. You know, to extend it closer to actual graffiti, because I have a lot of love and respect for the writers from Philly. I feel like if you do street art, especially in Philly, and especially if you’re from Philly, you kind of need to know that history, seeing as graffiti came from here. SD: So had you done graffiti before you started making stickers? DM: No, I was just coming from an appreciator’s standpoint of graffiti. The stickers came out of paintings and drawings I was doing in private. It was only natural that these pieces should be in the streets if I was going to involve handstyles in my work. SD: Based on your Instagram, it looks like you’ve worked in a variety of mediums. What’s your favorite? DM: I like using different mediums as a way to add depth to my pieces. Markers are the most practical to use on stickers, but any tool can by mixed in with others or used by itself, whether that’s pencil, charcoal, white out, spray paint, or whatever I have laying around. What gets used when is really just a matter of what I’m feeling at the moment. Same goes for whether I use color or just black and white. SD: Where do see your art going next? DM: I’d love to continue increasing the scale of my work. I’d like to tackle some large walls and three-dimensional spaces in the future. So if anyone out there has a wall they’d like me to come do my thing on, send me a message! Other than that, I don’t have any clear goals in mind besides continuing to put my work out there. SD: Who are the top three graffiti writers that inspire you? DM: Philly has such a rich history of amazing writers, it’d be really hard to slim it down to just three, but I’d say Kadism, Gane and Texas, and Agua. Kadism just from a historical perspective and reverential status in Philly writing. Gane and Texas, in my opinion, have pushed the boundaries of graffiti to ridiculous heights, both figuratively and literally. And Agua has taken Philly writing into an amazingly unique direction in the art world. SD: Do you have work available for purchase anywhere? DM: I’m always down to do commissions. Just DM me on Instagram! SD: Thanks, Darkmeal! Keep up the good work, and definitely let us know if — no, when — you do a large-scale piece! DM: Thanks for reaching out! Special thanks to Eric Dale for being our very first contributor! 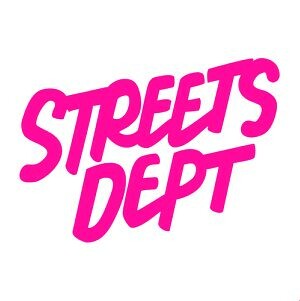 If you’re interested in contributing to Streets Dept, send me an email. See previous Streets Dept Interviews with Street Artists here: Blur, Inphltrate!